7 June Receive 1st e-mail from Sara. 8 June Apply for new passport as backup to current one. 10 June Typhoid and Meningitis update jabs. 13 June Apply for Nigerian visa. Obtain International Driver’s Permits (1 ‘normal’ and 1 valid only for Iraq, Nigeria & Somalia). 24 June Collect Nigerian visa and shopping for truck in Johannesburg. 27 June Apply for Angolan visa and shopping for truck. 29 June Deliver most of items purchased for truck to crew at Twana Lodge, Pretoria. 1 July DR Congo embassy closed for a holiday. 4 July DR Congo embassy informs me I require a People’s Republic of Congo visa first for a road transit from the south. 6 July Angolan visa still not ready. 7 July Apply for PR of Congo visa with 2nd passport. 11 July Collect PR of Congo and Angolan visas. 11 July Apply for DR Congo visa. 12 July Collect DR Congo visa. 16 July Fly Johannesburg to Harare, Zimbabwe and spend few days with Muzza and the truck. 20 July 878 km: Depart with truck (Day 1) Harare to Vic Falls. 22 July 462 km: Kasane to Ngepi Campsite (Western Caprivi, banks of the Kavango River), Namibia. 23 July 502 km: Ngepi to Dik-dik campsite (between Tsumeb and Grootfontein), Namibia. 24 July 499 km: Dik-dik to Hippo Falls Campsite (Ruacana), NW Namibia. 25 July 12 km: Visit Ruacana Falls and work on truck. 26 July 251 km: Hippo Falls to Cahama, Angola. 27 July 560 km: Cahama to Benguella, coastal Angola. 29 July 478 km: Benguella to Barra do Cuanza, Angola. 30 July 163 km: Cuanza to Barra do Dande, Angola. 31 July 110 km: Barra do Dande to Ambriz, Angola. 2 July Bus to Luanda for starter solenoid. 4 Aug 100 km: Ambriz to Nzeto, Angola. 5 Aug 90 km: Nzeto to Tombocco, Angola. 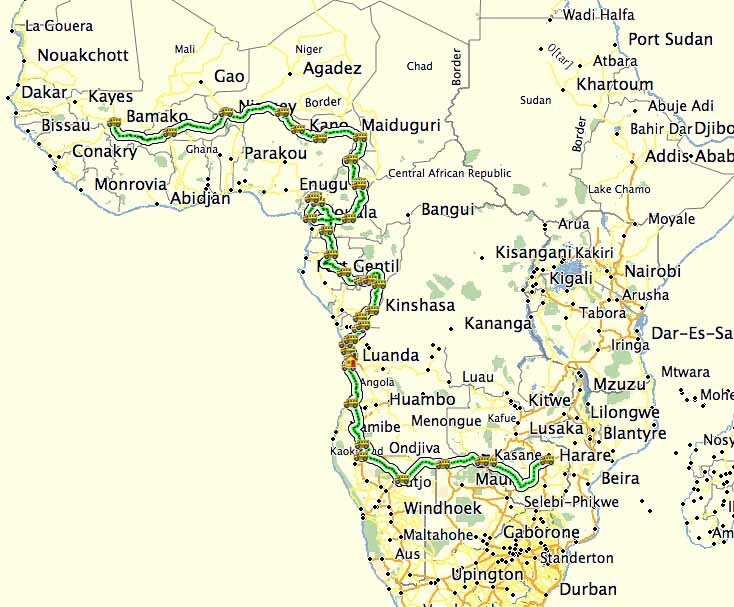 6 Aug 201 km: Tombocco to Luvo, Angola. 7 Aug 67 km: Luvo, Angola - Lufo (Democratic Republic of Congo) to Kimpese, DR Congo. 10 Aug Full auto-electric repairs at Hippocampe. 11 Aug Apply for Cameroon visa. 12 Aug Receive Cameroon visa. 13 Aug 316 km: Brazzaville to Gamboma, PR Congo. 14 Aug 253 km: Gamboma to Okoyo, PR Congo. 15 Aug Independence Day, PR Congo. 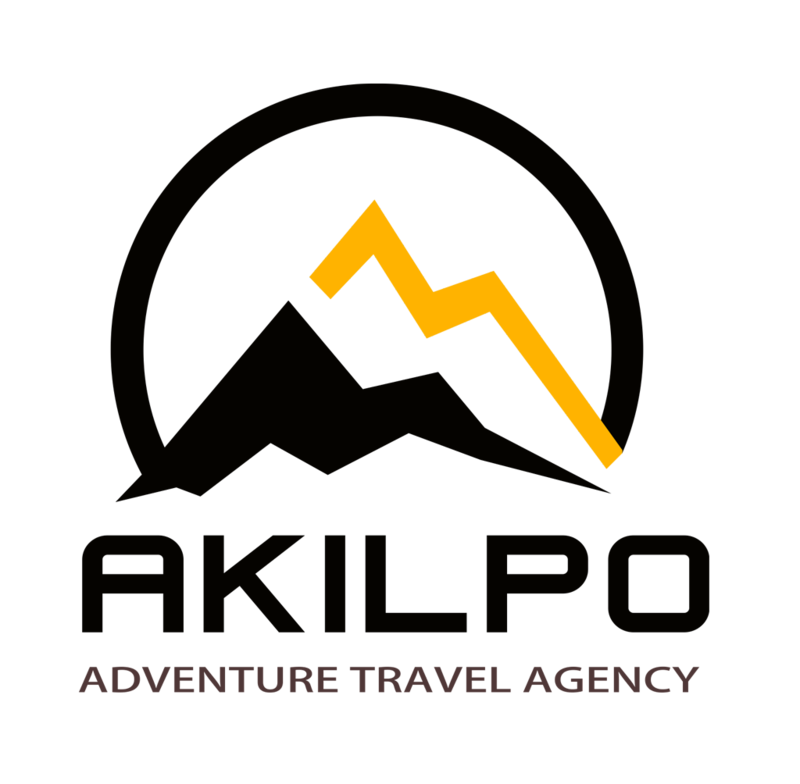 16 Aug 70 km: Okoyo to Mbie, PR Congo. 18 Aug 287 km: Leconi to Lastoursville, Gabon. 19 Aug 455 km: Lastoursville to Mitzic, Gabon. 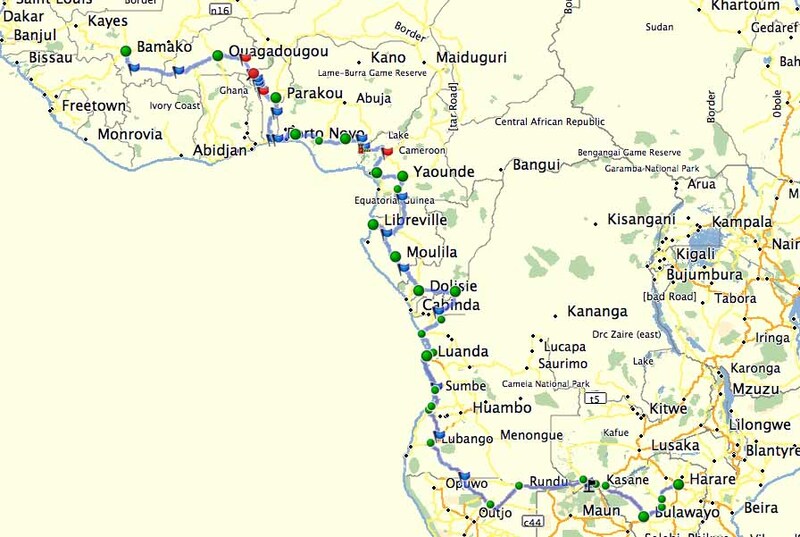 20 Aug 347 km: Mitzic, Gabon to Ebolowa, Cameroon. 21 Aug 392 km: Ebolowa to Douala, Cameroon. 22 Aug 324 km: Douala to Bamenda, Cameroon. 23 Aug 57 km: Bamenda to Batibo, Cameroon - Await repair of Mamfe Road bridge. 24 Aug 14 km: Batibo to hilltop village (Mamfe Road), Cameroon - Await repair of Mamfe Road bridge. 25 Aug 14 km: Hilltop village to Batibo, Cameroon. 26 Aug 120 km: Batibo to Bafoussam, Cameroon. 27 Aug 528 km: Bafoussam to Abong-Mbang, Cameroon. 28 Aug 530 km: Abong-Mbang to Yokotom, Cameroon. 29 Aug Await opening and clearing of road washed away. 30 Aug 145 km: Yokotom to village (via Belel), Cameroon. 31 Aug 349 km: Village to Garoua (via Ngaoundere), Cameroon. 1 Sept 225 km: Garoua to Touroua to Garoua, Cameroon. 2 Sept 294 km: Garoua to Mora/Banki, Cameroon/Nigeria border. 5 Sept Apply for Niger visa. 6 Sept Kano City tour. 7 Sept 268 km: Kano, Nigeria (receive Niger visa) to Maradi, Niger. 8 Sept 664 km: Maradi to Niamey, Niger. 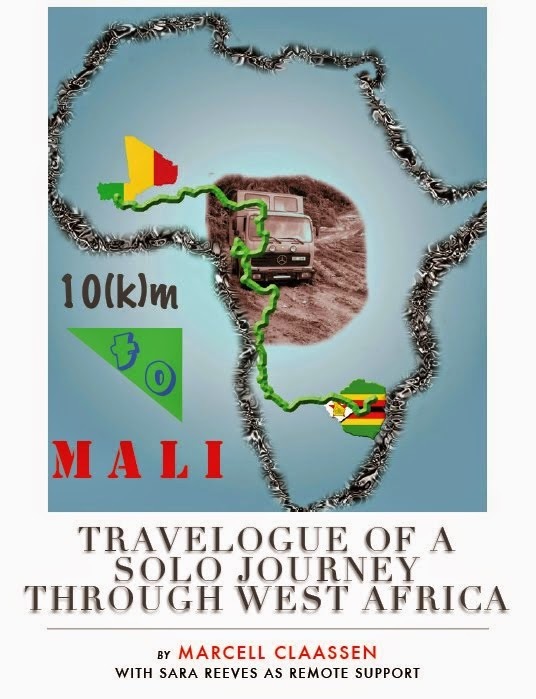 9 Sept 699 km: Niamey, Niger to Boromo, Burkina Faso. 10 Sept 808 km: Boromo, Burkina Faso to Bamako, Mali.